Between February 1 and 28, 2019, applications will be accepted here to take part in the drawing for tickets to the end of year concerts 2019/20. On this page, you will find further down detailed information on the ticket categories and a seating plan. Within the month-long application period, the actual time of application is irrelevant. An application made on February 1 has the same chances as an application made on February 28. After the drawing has taken place, you will be able to see on this page whether or not you have received tickets. All ticket information for the New Year's Concert can be found here. The drawing for tickets to the end of year concerts 2019/20 has taken place! If you participated in the drawing you can find out if you were selected to purchase tickets by logging in with your e-mail address and password. A seating chart of the Golden Hall of the Musikverein can be found at the bottom of this page. The Golden Hall of the Musikverein provides only a small number of wheelchair seats. This seating is available in the categories R1 (Ground Floor Box 4 right, 2nd Row, with visibility) and R2 (Balcony Boxes 4 & 5 left, limited visibility, as well as Balcony Boxes 7 & 8 right, 2nd Row, limited visibility) will be allocated using an online application form as part of the annual drawing. Those persons interested in applying for wheechair seating are invited to do so within the application period in February by using the online application form which can be found on this page. Each application for wheelchair seating includes a place for a wheelchair and a seat for an accompanying person. If you have a question about the drawing, please make use of the Help Center to find your answer. Musikverein, Golden Hall - Which Seats belong to which Price Category? For the Preview Performance, all seats in the balcony boxes, middle balcony, gallery and organ balcony are reserved for the Austrian Armed Forces. 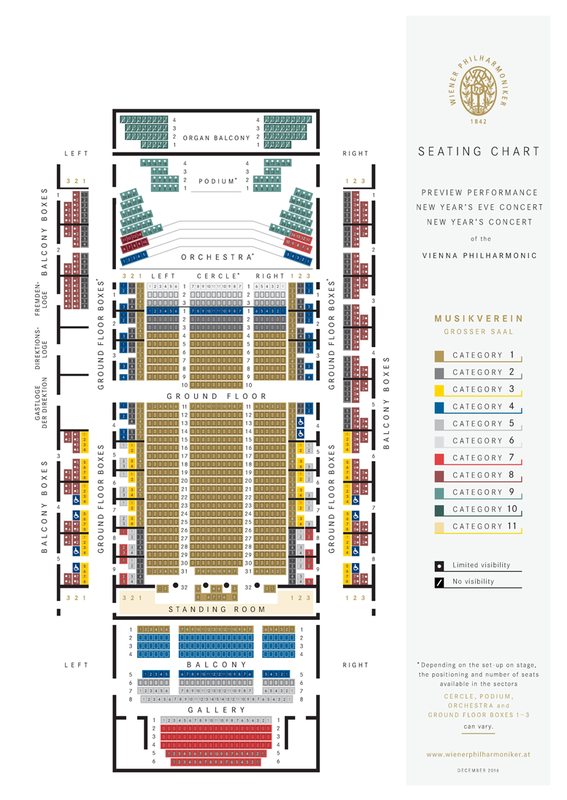 Please note that the exact seat locations in the seating chart for the categories Orchestra, Podium and Ground Floor Box 3, right and left, are not binding. This is due to the varying orchestral seating arrangement and the positioning of the cameras for the television broadcast. Please note that not all seats are offered in the drawing.